We all know how boring the school holidays can get; especially in the dreary Yorkshire weather - keeping the kids entertained in the house all day can be an utter nightmare! 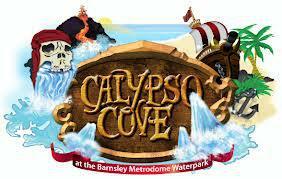 So why not take the family down to the Calypso Cove, at Barnsley, Yorkshire's biggest and best pirate themed Waterpark. With rides to entertain all ages, it's a day out the whole family will love. 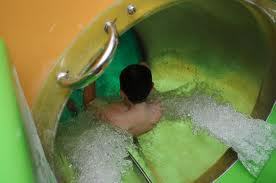 There's a giant play ship 'The Sunken Galleon' for the little ones to explore complete with junior slides, then there are racing slides, a wave machine, diving boards, and my favourite; 'Eruption'; a flume with a giant bowl attached, that sliders are spun round and then dropped swiftly out of, in to a deep water pool. The best ride for the adrenaline seekers has got to be 'Terror Torrent', one of the fastest water slides in the UK. For the younger or more timid sliders, the sea creature slide 'the Kraken' is a must, a fun and fast green flume slide everyone will enjoy. So what to do with the thirst and appetite you've worked up on all these rides? There's 'The Hideout' of course! A themed restaurant inside the Waterpark where you can eat and drink without leaving the indoor centre. Best of all, The Hideout overlooks the rides and pools, so those boring parents can relax throughout the day with a book and watch older children playing without even getting wet. So the next time you're feeling stuck for something to entertain the kids with, or you've got a rainy day with nothing to do, head down the Calypso Cove at Barnsley, you certainly won't regret it.